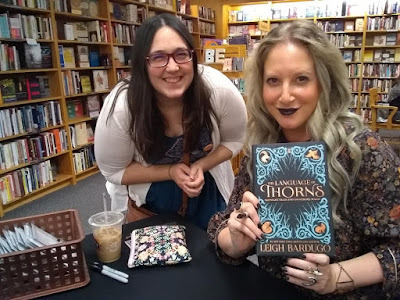 I'd been SO excited about Leigh Bardugo's The Language of Thorns tour stop ever since it was announced. Because it was in Grand Rapids, which happens very rarely! And because of my job, I've been driving more of certain areas in the city, and luckily Schuler's is in a place that I could get to. I had a little bit of anxiety at the start of this. My lovely friend Sabrina was unable to go, so I was heading to an event where I would be alone. Normally, I don't mind, but bookish events are 100% better when you've got people with you. Plus, there was going to be a wait with the signing (it was in order of your ticket #), and that could get boring. But what's great is that I knew someone else who was going! Theresa and I have known each other a few years now, and she was gonna be there. She also saved me a seat, which was SO NICE, and honestly great because we were in the second row and I could hear everything and feel like I was part of the Q&A session. The event was moderated by someone who does a lot of the moderating for book tours at the Lansing location, and she was really funny. Her and Leigh had a wonderful banter going, and I felt like we got so much information on Nikolai's upcoming book, King of Scars, and also random facts about Leigh that kept the whole crowd laughing. Leigh said she once had a dream that she and The Darkling were having a cooking competition on the Shadowfold ala Chopped style. Someone asked what her characters would make, and I don't remember all the answers. Nina would obviously do a waffle dish, and Kaz would probably make this glamorous meal to be like, "Didn't expect that, did you?" She teased that Nikolai was supposed to die in Siege and Storm, and when the crowd reacted, she was like, "but he didn't! ...yet." SO RUDE, LEIGH. She mentioned that she goes away during October because everyone wants her to do their Halloween makeup. (I don't blame her). That's where the idea of Shadow and Bone came from, a retreat in the mountains during October, when she thought about the dark being a tangible monster and how someone would fight it. When asked her favorite character, she said she must've really loved Nikolai not to kill him off. She also mentioned Genya (!! who I love). She likes to think Wonder Woman chose her, and it was an honor for her to be able to write about Diana and the Amazons. After that, the crowd dispersed to wait for the signing. I was #79, so I didn't have THAT long, and I mostly shopped around the store. I found some cute socks for my #otspsecretsister and some holiday cards for these things. I also saw a Shakespeare love mug that I had to force myself not to buy. (I just really love Shakespeare, okay). I actually chatted with someone I didn't know in line a little, which I hope went well? And then I finally got there, and someone needed to leave, so they cut in line. OKAY, FINE. (I really didn't mind, but I feel like this *always* happens to me). Anyway, the signing was pretty rushed, so I didn't even really get to talk to Leigh. And she didn't remember me, which was sad. She asked me if I'd chosen the witch button, or if it chose me. I was like, it was hard to choose between Queen and witch, but I always choose witch. And she's like, or you can be both! A witch queen. Which yesssss. She personalized TLOT and signed three other books I brought (SoC, CK, and WW). Yet so, I had a great time listening to the conversation almost more than meeting her again? But I AM very happy that I got this awesome picture with her. I left after that, and I definitely was sad to miss Sabrina, but the event was fun. It was so great to finally meet Theresa, and I JUST LOVE BOOKISH EVENTS SO MUCH. Please, publishers, send more of your authors to Grand Rapids? Kay thanks, love you.